InterpreterMag published a good article about Nadiya Savchenko getting blamed for being accomplice in the killing of two Russian journalists near Metalist, sound engineer Anton Voloshin and reporter Igor Kornelyuk. See the original RT-report here. According to RT the cameraman walked forward, filmed the scene and was able to get away, while his two colleagues were hit by a shell while staying behind. There is also a longer version of the video showing a bit more and omitting another part. The shorter video also has been cropped to delete the RT-logo. But as can be seen by these screenshots, these are NOT the same locations being filmed. There is no big billboard in the shot with the explosion and there is no sand heap there either. But these civilians keep walking towards the area where the explosions happen, which is... quite weird! A truck with Vostok fighters was hit BY THEIR OWN fire while retreating from Donetsk Airport. But they filmed the aftermath extensively and blamed Ukraine for shooting a truck with wounded soldiers. See this blog. ANNA news pretended to film how 'rebels' slipped into Slavyansk, but they just staged a scene for the cameras. See this blog. There were dozens and dozens of videos from fighters firing wildly at Donetsk Airport in Rambo-style without any return fire being heard from Ukrainians. Most of these men we never saw again, because they got killed in the REAL battles. They staged an attack near Donetsk Airport which set the oil storages on fire to get spectacular images for tv. See this blog. Russian tanks shot at a residential building in Vuhlehirsk just to make shots for tv. See this blog. Besides staging scenes for tv, they also have a complete production team for creating extreme and fake videos of 'Ukrainian atrocities'. See this blog. And what's more, here is a well documented incident of Russian proxies trying to kill a BBC-crew with mortars at Donetsk Airport. See this blog. And then there are the many fake actresses appearing in videos among which notorious Maria Tsipko. See for instance this blog. So with this knowledge, could we have another look at this Metalist-video? Especially because Nadiya Savchenko is being blamed for the killing of these journalists! Let's analyze the longer version step by step. This could be called a 'professional edit'. Have the guy look somewhere and then let the viewer see what he sees. With the front of the vehicle in top of the view, the viewer immediately is able to interpret and understand the situation. Even though the camera is shaking a lot (this is sometimes purposely done to give the footage a candid character) the filming and editing is done very professionally. There is no continuity here. Not in movement, but neither in zoom level. The new shot is all of a sudden zoomed in a lot more, which is physically impossible. It means there was a cut. Because the camera is moving and you immediately hear the sound of an explosion, as a viewer you don't notice the cut, but frame by frame analysis makes this very clear. It means the soldier would have been long gone from near the truck by the moment the explosion happened. But this kind of editing suggests he was fully hit. So these people happily walk towards the area where an incoming mortar just exploded? It SEEMS as if they are close to the explosion area, but this is an optical illusion you get when the camera zooms in a lot. Distances get compressed when zoomed in. Filming like that is a professional (and suggestive) trick! Then we can hear the sound of an incoming mortar shell and an explosion. But we can't see where it exploded. Rubble from a possible impact can be seen on the road. Google Earth indeed shows there are trenches there with sand heaps. Since this was filmed at the crosspoint, it must have been filmed BEFORE (or maybe after) they walked towards the vehicles blocking the road in the first scene. CLEARLY the order of shots have been altered because they had been shot from different locations 150 meters apart from each other. This is purposely done to give the impression the soldier dragging a wounded comrade was fully hit by a shell. Again, this is professional, suggestive editing and in this case: misleading as well. After these explosions the camera keeps rolling while the guy runs for cover into the bushes. But what do we see in the last frames? Two civilians (again!) happily walking towards the blast area and they do not seem to be bothered at all. Video 1 and Audio 1 are the Erich Hartman video. Video 2 and Audio 2 are the RT version. In this way it is easy to see where the version overlap and have unique parts. The three ellipses show where the explosions happen. Let's call those I, II and III. No firing of (distant) mortars can be heard. But this must be due to the fact that that part had been cut off. The clip only starts with the explosions. The blue arrow shows the incoming whistling sound of a mortar shell. Part II has two or even three explosions: three (distant) launches can be heard (red arrows), two audible explosions (yellow arrows) and two different explosions can be seen in the video as well. The time between the first two launches is just 3 frames, that is 3/25 = 0,12 seconds. Between the second and third is 7 frames, that is 7/25 = 0,28 seconds. Between the first and third shot is 0,4 seconds. Could it be that there indeed were 3 impacts? And that two landed almost simultaneously so their sound could not be distinguished? The big red circle clearly is the explosion at the side of the road. Possibly two smaller craters can be seen on the road. The orange circles indicate where shells might have landed outside the view of the camera. It means GE seems to indicate it is indeed possible that there were three impacts, two very close together on the road. Mortars from 2B9 Vasilek or multiple mortars firing simultaneously? This either means a 2B9 Vasilek 82mm automatic mortar must have been used, because it is the only thing that can fire rounds really quickly, or a setup with at least three mortars must have been used, firing simultaneously. It means every 0,5 seconds it can fire a round. In this video the firing of a Vasilek can be seen. The shortest measured time between to launches was 7 frames = 0,28 seconds. It means the ROF is higher than Wikipedia says. But 3 frames/0,12 seconds seems to be VERY low. So it seems a setup of multiple mortars must have been used. It means the position of the mortar was very closeby. The muzzle velocity of a 82mm mortar shell is 270 meters per second and it takes a more or less hyperbolic path. Sound is faster and travels at 340 meters per second in a straight line (is shorter route). It means the sound from the firing arrives first, the shell and its explosion arrives later. The whistling noise arrives just before impact, because that sound is slightly faster than the shell itself. To put it simple: the further away the mortar is, the longer the time between firing and impact. The shorter the time between firing and impact, the closer the mortar is. To make calculations not too difficult, we'll do it like this: IF the shell would travel in a straight line (which it never does) the MAXIMUM distance can be calculated like this: the difference between the distance (d) traveled in 270 m/s and 340 m/s must be 1,8 seconds. The result from this calculation is 2.360 meters. IF the shell would take 2 times as much time to travel its HYPERBOLIC path it would travel at an average 135 m/s. In that case the calculated distance would be only 403 meters. The mortar must have been anywhere with the range of the red circles. The nearest Ukrainian positions are 9,5 kms away from the Metalist crosspoint. Even the golf course is still 6,5 kms away. The 2B9 has a maximum range of 4,3 kms, the calculated range (with an absurd straight line to the target is 2,4 kms, the likely range would be more like 1 km maybe. It means THERE IS NO WAY the Ukrainians could have fired these shells. The shells were fired FROM WITHIN Russian occupied territory. It must have been used more than once. More southward are more such positions. So it is very well possible that the crossroad has been shelled from this position. One part of the explosion is facing slightly upwards, creating the larger part of the blast. The other part of the exploding shell is facing downwards INTO the ground, thus getting more resistance and creating the smaller could of dust. That means the smaller part is facing the direction of impact and the larger part is facing forward. THAT means the shell came from southwest direction. MAYBE a pattern can be seen there as indicated in the right side of the image above. This may coincide with the approximate southwest direction from the video. Starting from 850 to 1.800 meters there is an area to park and hide a truck with a mounted Vasilek between the bushes. We know they typically use this set-up for such hit-and-run operations. See this blog for instance about the Leninsky Bus attack. Or this one. This direction does NOT correspond with the other known mortar area (orange ellipse). 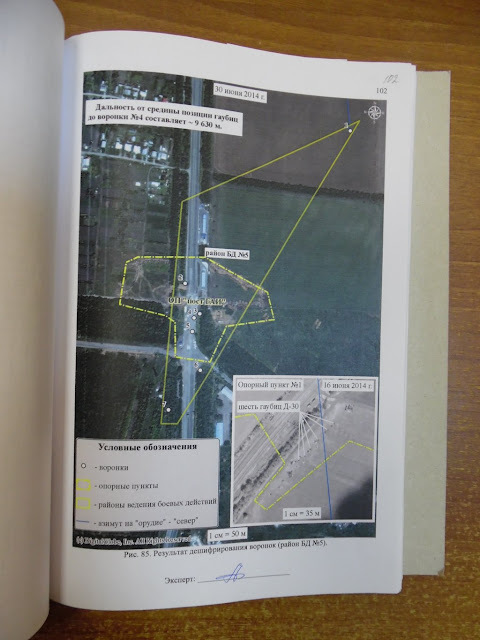 It shows Ukraine/Aidar had not shelled this crossroad up to June 30th and thus not on June 17th either. So this must have been the CP NORTH of Metalist and not the one SOUTH. That makes sense because the northern one would be the first one the attack force would meet. Also this was during darkness until sunrise. While the RT video was recorded at 10:40 during daylight. The behaviour of the civilians in the videos is extremely weird. They walk towards the impact area, instead of walking away from it. And they don't seem bothered at all. This raises doubt. Where they hired and instructed to walk like that, because 'they were making a video and they didn't need to worry'? The videos definitely have been edited for effect and propaganda purposes. It wants to show that Ukraine deliberately shelled civilians (and Russian journalists). This type of manipulation casts doubt on the originality of the video. Could it entirely have been a setup? The firing and impacts seem to be very real. It does not look like controlled explosions. It does indeed look like incoming exploding mortar shells. The quick sequence of multiple launches and impacts indicate a setup with 3 mortars must have been used. The very short time between launch and impact of 1,8 seconds indicates the range could by no means have exceeded 2,3 kilometers. More likely the range is somewhere between 1 and 1,5 kms. The closest Ukrainian artillery position was 9,5 kms away. The most forward Russian position was even 3 kms up north. This means the shells had been fired from Russian occupied and controlled territory. The maximum range of a Vasilek and/or 82mm mortar is 4,3 kms. Even that is out of range of Ukrainian positions. That means Russian( terrorist)s fired the mortar. 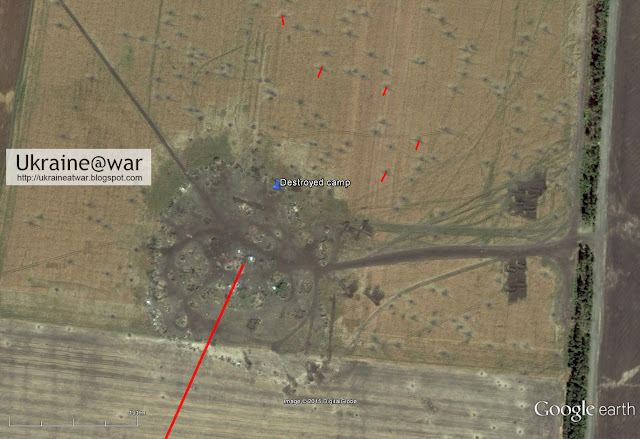 There is a known Russian mortar position within range that could have fired the shells. The possible direction of impact indicate it was fired anywhere between West and South direction. There are many good spots to hide a (truck-mounted) Vasilek or a regular mortar setup in that direction from which the crossroad could be fired at. But even if fired from a different direction... the Russians are well-known by now to fire from THEIR frontline to their back, into their own occupied territory as to give the impression Ukrainians fired upon them/civilians. Truck-mounted Vasilek are known to be used for such similar hit-and-run attacks on civilians. Ukraine had not shelled that crossroad at least up to June 30th. A. It was an accident: the Russians, like they have done so many times more, wanted to make great footage for TV. So they send in the journos and fired mortars. They got great footage, but unfortunately the journos got hit and died. B. It was a setup. They hired the civilians and they sent in the journos. It was there intention to get victims and drama. Luckily the civilians did not get hit. But the journos did. C. It was a trap. Unaware, the journalists and civilians were targeted by some terrorist team with mortars. The most likely scenario to me seems to be B. They had lured the civilians into the deadly trap and wanted to get great shots for TV. When you play with fire, you can get burned. And so the journalists got killed instead. The Russians make a story and a show out of it anyway. You don't think they are capable of doing something like this? See this video where Motorola is deliberately shelling his comrades as a practical joke. On another day people can die like that. Whatever EXACTLY the truth is in this case, it is just another example of Russians killing Russians (possibly even TRYING to get civilians killed) and then trying to blame Ukraine for it. In this case even Nadiya Savchenko who was busy saving wounded comrades. The (last three) explosions must have come "from the right side", which is somewhere between south and west. It is impossible that Ukrainians shot this artillery from 9,5 kms because you would not even hear the firing anymore from that distance! You would ONLY hear impacts. Only under very favorable circumstances, like no obstacles and wind is right) you might hear something. But not like it is in the video. The short time between launch and impact indicates it must have been fired from 1 to 2 kms distance. It must have been a setup of three small mortars with a commander giving a fire command so they fire simultaneously. They must have set up, aimed and tested them (long) before the video was taken, because the impacts were on spot right away. The smoke in the destroyed bus (in the beginning of the video) is suspicious. It is an indication it has been fired upon previously. All this is more than a confirmation of the findings in this blog. It has been published on July 3rd 2014, meaning it has been recorded on or before this date. This typically is the environment we already mentioned. The green stroke with the larger trees is most prominently visible. There are several smaller trees (yellow) and a distinct single one (red). But it might be slightly different too, either a little bit more north or south. We can clearly see the first two poles with the trees in front of it. The third group of three poles can be seen going over the crossroad. From the camera position those appear together in a group. They are aiming approximately at the crossroad where the three poles are !! This makes sense, because the Ukrainians are trying to take this crosspoint. In the beginning of the video, they remove branches from the mortars that are already there and positioned. Without much effort they fire them. This is exactly the situation the military expert described, without him even seeing this mortar-video. This video proofs that the Russians had three mortars pre positioned in that area and aiming at the crossing on/before the 3rd of July. Satellite images on Google show that the tracks and traces are not present on July 5th and several positions appear on the June 30th video. This shows that area has been used multiple times. The mortar-video itself is not showing the firing that occurred on June 17th, because the mortars fired independently from each other, while the firing on the 17th happened simultaneously. So this must have been filmed during another event. Nevertheless this even more demonstrates that the 17th-shelling was an orchestrated deliberate attempt to get some people killed there, because the reason to fire simultaneously is to get multiple explosions at the same time giving less chance to flee and escape any of them. But even this impact is indeed from Ukrainian origin, it is 600+ meters apart from the Metalist Checkpoint and therefore must be considered a lone/stray impact without any relationship with the Metalist impacts. It's direction does not proof the other impacts also came from Northern side.